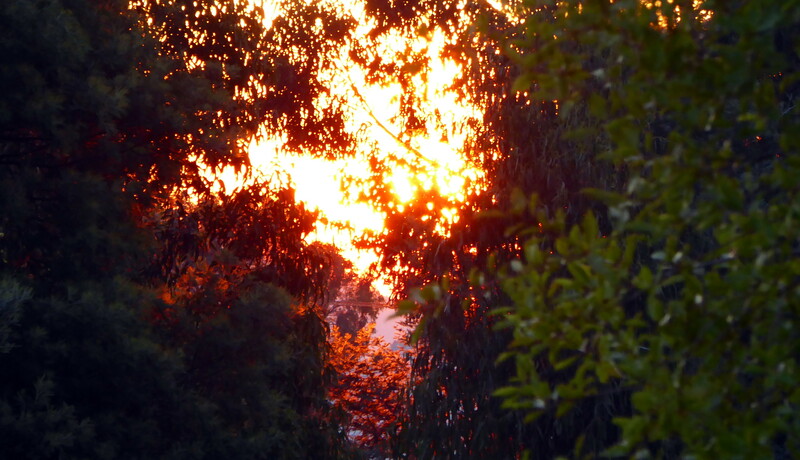 That glorious golden orange glow entices me – what wonders lie beyond? It did/does give me that feeling of magic when I look at it. Beautiful. Looks like the kind of light that offers peace and tranquility. 🙂 Holidays are a double edged sword, aren’t they? Thank you Winifred. Nature is a spectacular artist. Sometimes it is hard to photograph sunsets, but this is really what it looked like. I just wish I could have got more of the golden glow effect through the trees, but the further I zoomed the camera back the more I lost it. Thanks Marigold. It’s not often I get sunsets like hat here, they seem to generally be light pinks, but this was magnificent. You were right, comments had all landed in Spam! And Posts too, So I just saw your wondrous pic of that sunset. Truly a beautiful picture! Congrats! thanks – it was beautiful through the trees.